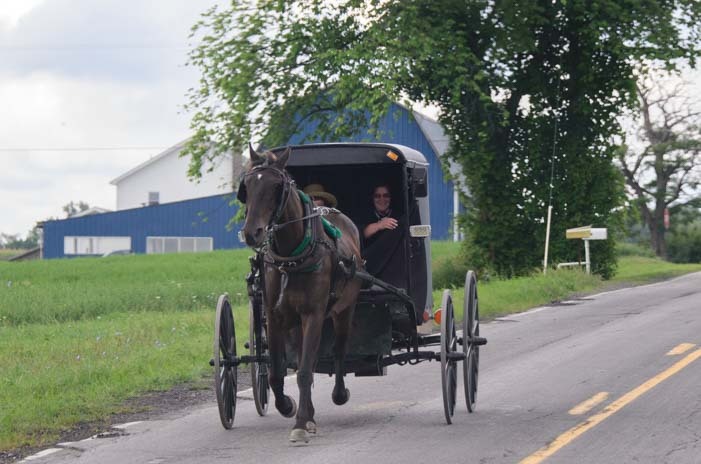 August 2015 – During our stay in the Finger Lakes of New York, we got very accustomed to hearing the clip-clop of horses’ hooves as the Amish made their way across the countryside on the back roads. These sleepy lanes are ideal for their old fashioned way of getting around, and we saw them everywhere. The Amish live very simply, farming modest plots of land, traveling by horse and buggy, wearing hand sewn dark clothes and avoiding anything driven by a gasoline engine or electricity. These choices seem a little odd, but the nice benefit for the people who live near them is that they are preserving a way of life and use of the land that is a unique throwback to the America of 100 years ago. 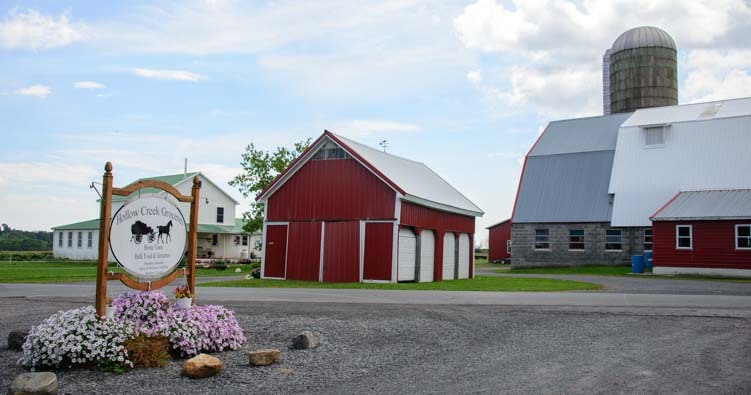 We loved driving down the roads between the Finger Lakes and seeing one small farm after another. Without the Amish this land might be just ordinary house lots or huge commercial operations like everywhere else. 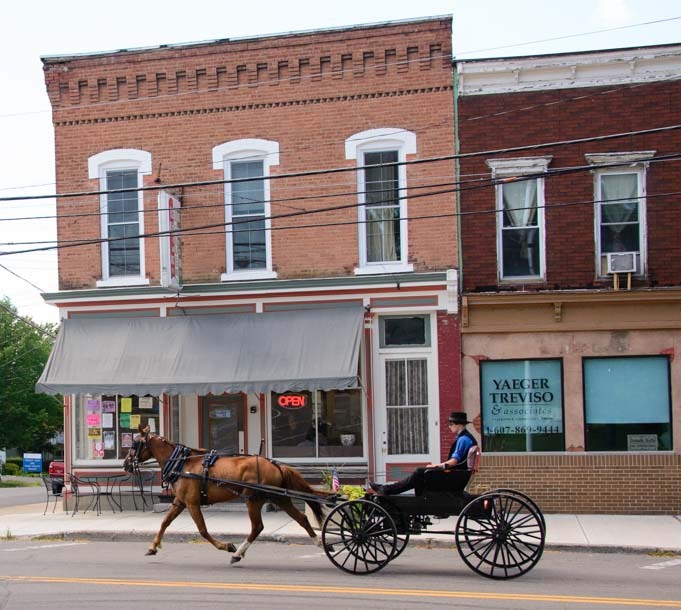 Some of the lifestyle choices that the Amish make are to avoid dependence on society at large. 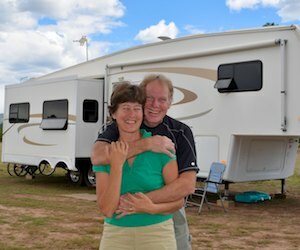 So, living without electricity, a cell phone, TV, computers or car means they don’t have to purchase all those services or depend on the non-Amish people who provide them. It also means they live a lot more cheaply than most people! They do, however, carry mortgages, pay taxes and buy things, so they need a way to earn a living. 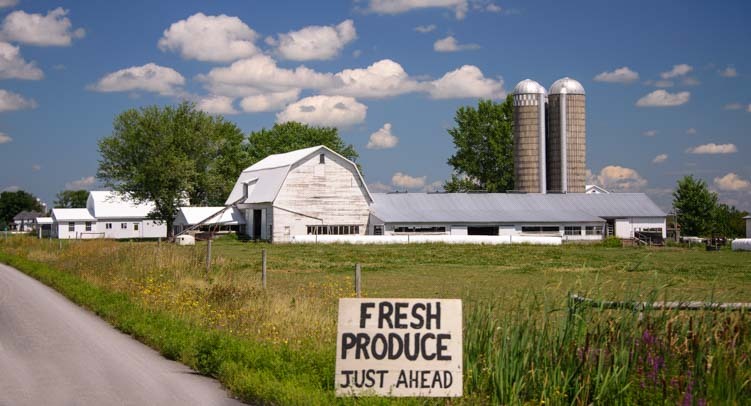 Many sell produce and livestock they raise on their farm or manufacture things they can sell. The Amish are entrepreneurial and sell their goods to outsiders as well as each other. Happy hens wander around outside on a summer afternoon. He has 5,000 hens who lay 4,700 eggs every day. 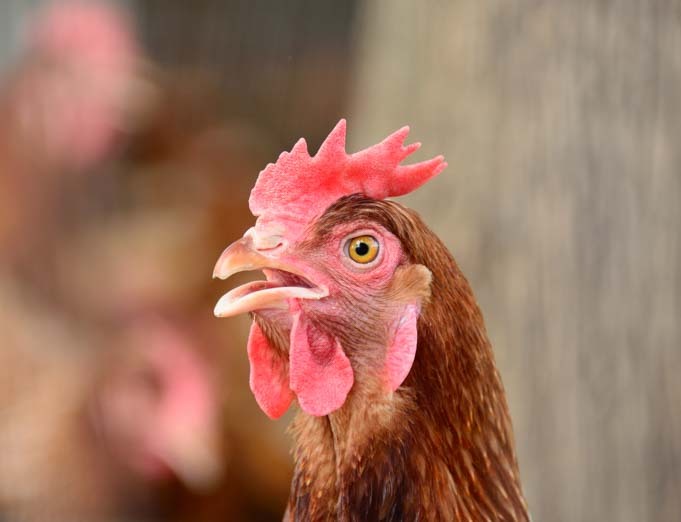 These are “free range” chickens who can come and go from their coop as much as they want. He said they tend to all go outside at dawn and dusk when the weather is good, although there are always a few stragglers who prefer to stay inside. Things were a little more chaotic inside the coop. He has one rooster, a big white fellow that has a room of his own at one end of the chicken coop. His door is always open, so hens can visit him and he can mingle with his female friends. I assumed he was there to help the hens get in the mood for laying, but Toby said they will lay whether a rooster is present or not. He just keeps the rooster because he likes to hear him crowing in the morning! Down along both sides of the chicken coop there are little boxes where the hens can go in to lay. Most of them get their laying done before the afternoon, and the eggs gently roll out the backside of the box. These are then collected by hand. 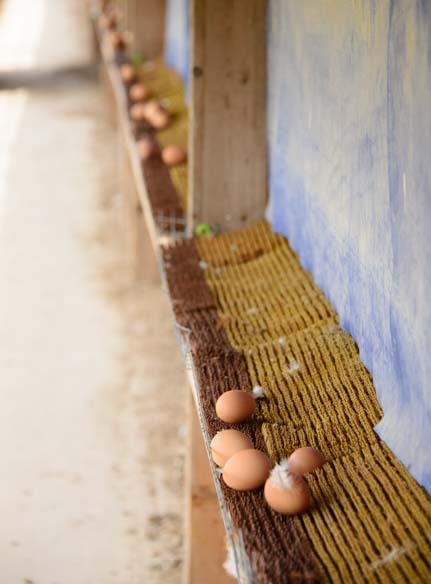 An automated conveyor system brings the eggs to the front of the building where they are put into cardboard egg cartons. Eggs roll down for easy collection. Toby knew the production of his flock right down to the egg and tabulated it on a clipboard each day. 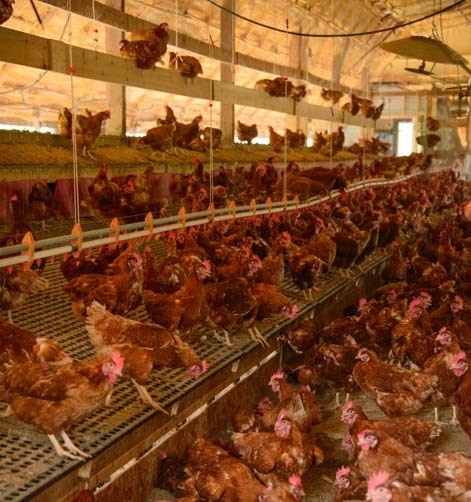 Recently he had seen a dramatic and scary drop in production — down to just 3,900 eggs a day. The veterinarian could not explain it. Toby suddenly got the idea it might be a bad batch of feed and exchanged all his feed for another batch from the feed company. Sure enough the egg production began climbing again, and it was just getting back to his usual 4,700 eggs a day when we visited! Toby doesn’t know his hens individually, but he knows exactly how they are doing as a flock. Perhaps what floored me most was that he had bought this flock as chicks and they had all grown up together. So, they lived as a group their whole lives. 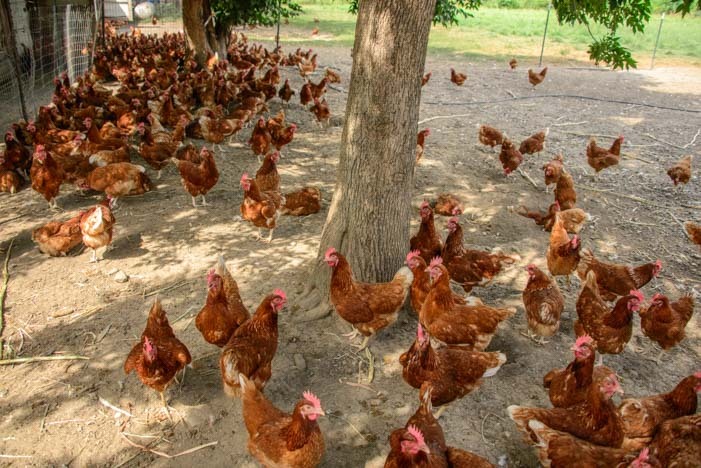 He would keep the flock for just 14 to 16 months, and then, when their production began to fall off below 4,500 eggs a day, he would retire them and sell them off to buy a new flock of chicks. Sadly, their next step after retirement would be a trasnformation into chicken nuggets. We stopped at Hollow Creek Groceries to see what a small Amish grocery store was like. 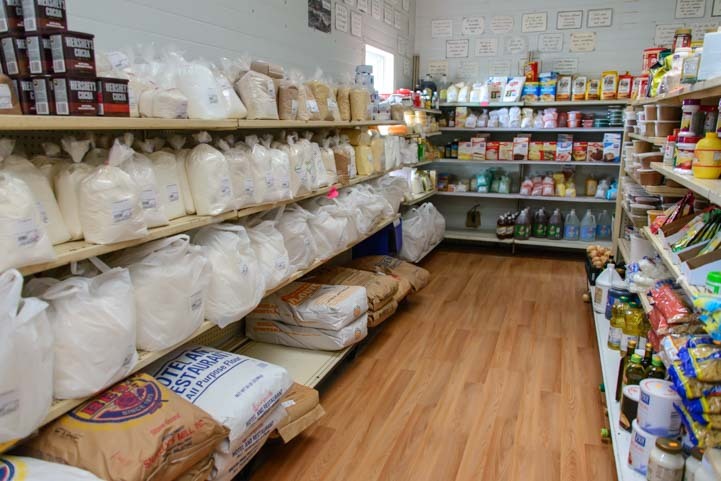 Since they do all their own cooking and make all their baked goods from scratch, the store carried many different types of flour. Cake flour, pie pastry flour, in both white and whole wheat varieties, and bread flour of several different types. It was amazing how important flour is to the Amish kitchen, considering how many modern kitchens don’t have any flour in them at all these days. I’ve never seen so many different varieties of flour. We also discovered that the Amish in the Finger Lakes area power their homes and businesses with piped in gas. At night their houses are as well lit as any electric house, but the lights are all propane based. We were very fortunate one afternoon when an Amish mother and daughter stopped in to visit us in our fifth wheel trailer. They were fascinated to see our little home on wheels. As we showed them all our appliances and how they work, we found we all had a lot in common with them. Just like us, their refrigerator, range, oven and hot water heater ran on propane. They don’t use solar power, however, which surprised me. I would think they could maintain their independence from outside society with solar power, but it isn’t something their culture has embraced, at least not in the Finger Lakes. 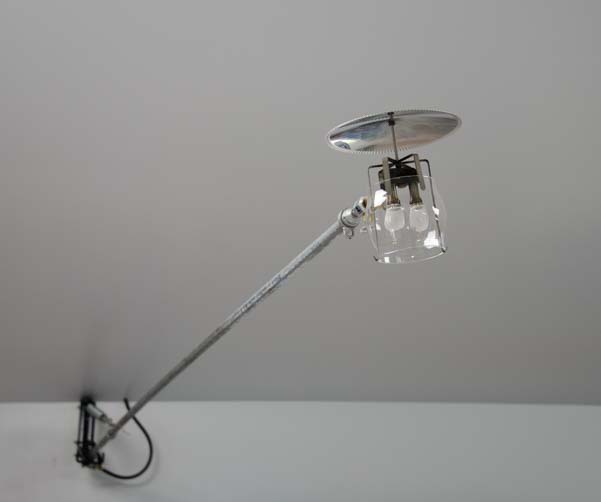 The Amish rely on gas power for many appliances, including lights. We also visited an Amish dairy farm. We arrived right at milking time, and not knowing anything about farms or cows, it was quite a surprise to see the cows being hooked up to milking machines. I had expected to see the Amish do it by hand, sitting on little stools. They laughed out loud when I told them that, and then showed us some very sophisticated stainless steel refrigerated milk tanks that kept the milk at a precise temperatures. 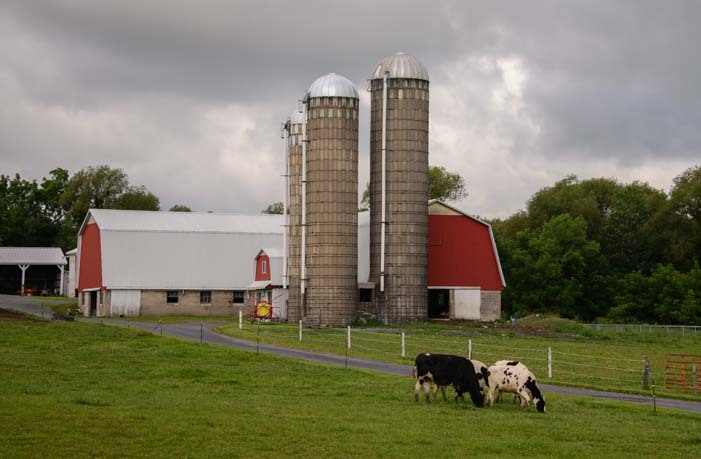 This particular dairy farm sells all their milk and cream to an organic yogurt company. Cows lined up for milking. The farmers at this dairy loved cats and had quite a few farm cats running around. One black cat was particularly fond of the cows and had struck up quite a friendship with one of them. She rubbed her head all over the cow’s nose, and the cow gave her a gentle licking. I was so struck by this sweet relationship, I reached out and patted the cat as she passed me. Ooooh – her head was all gooey!! 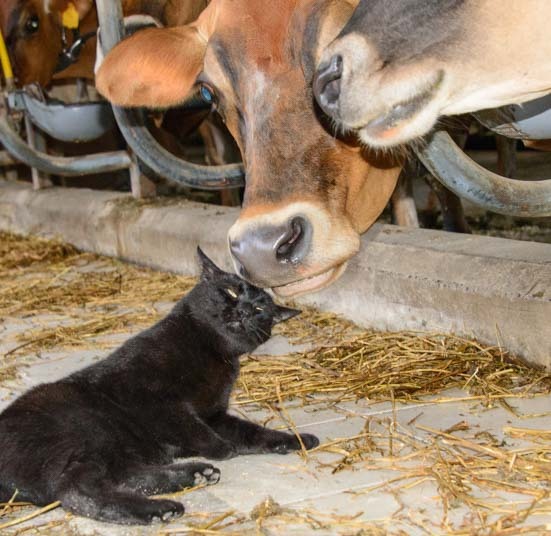 This little black farm cat had a touching relationship with this cow. There was a little calf out back that was in a pen by itself. It was still nursing age but drank eagerly from a bottle. 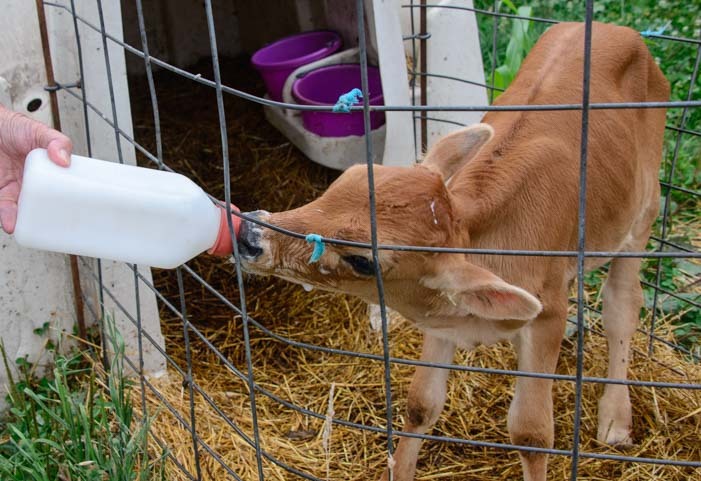 A calf is being bottle fed. There is something fascinating and heartwarming about how the Amish choose to live, even though it is a hard life and a lot of their rules don’t necessarily make sense. The directives they follow are set by the local bishop, so the list of things they can and can’t do varies from region to region. One central commonality among them all is that they worship in each others’ homes, not in formal churches. So, they make an impact on the world around them by their style of dress, the way they get from place to place, and their many farms and the goods they sell. But you won’t see a big community church or imposing Amish steeple anywhere. We thoroughly enjoyed this little glimpse of Amish life. We loved our RV travels to the Finger Lakes and were fortunate to be able to get a glimpse of the Amish in their daily lives. 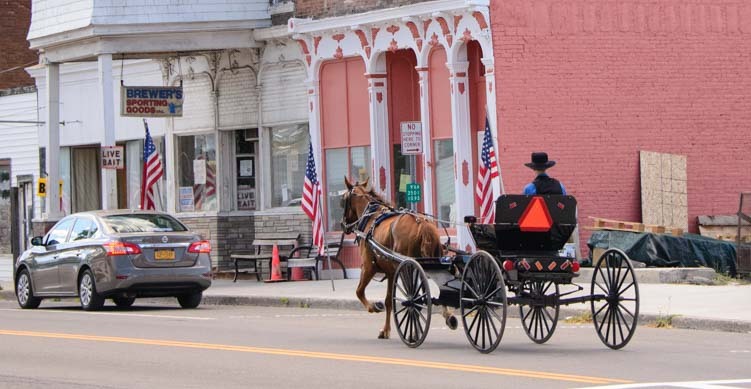 Perhaps the most special thing about the Amish in the Finger Lakes is that their presence is not marketed by the local tourism boards as an attraction the way it is in other places. This makes them blend into the landscape as being an unusual facet of the surrounding communities rather than standing out as strange museum pieces. This entry was posted in New York and tagged Finger Lakes NY, New, New York, Travel, USA, WP Travel by Roads Less Traveled. Bookmark the permalink. “Sadly, their next step after retirement would be a trasnformation into chicken nuggets.” Nice turn of a phrase. I’m still laughing about this one. I enjoyed reading this article today. I grew up in NW Pennsylvania, in Amish country. I used to go to the Market House with my grandmother every Saturday (back in the 1960s) where she would sell the flowers she raised for “pin money”. There were always Amish folks at the market house selling their wonderful bread, cookies, eggs and milk. My cousin still lives in PA and an Amish lady helps her with housework. I inherited several partially finished quilts that my grandmother made, and I sent them to my cousin to have her Amish friend and her family finish them, all by hand of course. Win -Win – I received finished quilts, and I paid them for their time. A simpler way of life indeed! Safe Travels! What a wonderful story, and what a great way to pay homage to your grandmother and the Amish! We went to a fabulous Amish produce auction that I’ll be writing about in a post here soon. Maybe some of that will bring back memories of the Market House!! What a wonderful place to grow up, Sam. We just loved our stay in the area and really enjoyed visiting your family’s store!! We don’t know any Amish farmers near Homer, NY. You might stop in one of the Amish markets near Homer and ask the Amish folks in the store if they know any carpenters who would be interested in a project like yours.